Layton Nyama lives in Makawa, a village in Mangochi along the southwest arm of Lake Malawi. His only source of income is fishing. Last year, though, Layton began having trouble doing his work. He developed an uncontrollable headache, general body pains and dizziness, which cut his productivity dramatically. His health continued to deteriorate until he met Phillip Theu, a peer mentor with Pact's Fisheries Integration of Society and Habitats (FISH) HIV Test and Start program, which is funded by USAID and PEPFAR. Phillip referred Layton for an HIV test. "When Phillip suggested that I should go for an HIV test, I was shocked," Layton recalls. "I started imagining myself being very sick because of HIV. However, Phillip encouraged me that knowing my HIV status would be an entry point to get better medical and social support for my health problems." In February of this year, Layton tested positive and immediately began antiretroviral therapy. He is one of more than 5,800 fishermen who have been referred for HIV testing in Mangochi by peer mentors with the FISH Test and Start HIV program since January. The program is working to create demand for HIV prevention and treatment services among fishermen and fish processors. It's connected to Pact's larger FISH project, which is working to increase social, ecological and economic resilience to climate change and improve biodiversity conservation through sustainable fisheries co-management across all major lakes in Malawi. Because FISH targets fishermen, it made sense to incorporate an HIV component into the project to bring HIV information and services closer to fishermen, who are a critical population in the effort to stop the spread of HIV in Malawi. Beyond outreach through peer mentors, Pact conducts targeted HIV community mobilization on beach sites where there are many fishing activities. Pact works together with Baylor College of Medicine in Mangochi alongside government health facilities to bring HIV testing and mobile clinics and tuberculosis screening closer to fishermen. 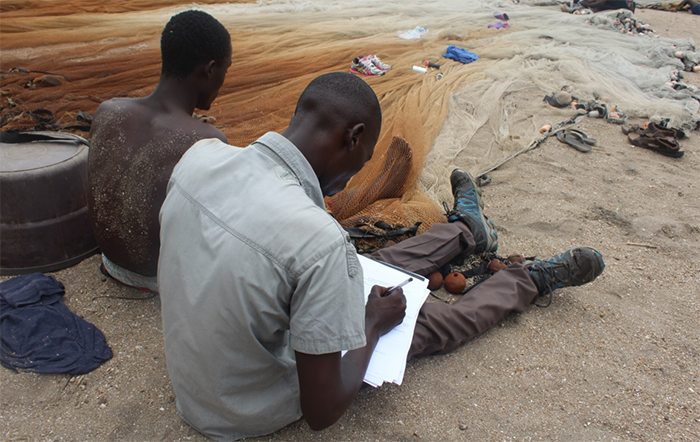 A peer mentor in Mangochi refers a fisherman for HIV testing right on the beach. In January, Pact identified 95 fishermen in Mangochi through Beach Village Committees, trained them as peer mentors and gave them referral books, which they use to refer fellow fishermen for HIV testing. Peer mentors also provide education, distribute condoms and engage with community members to promote HIV prevention, testing and treatment. Since April, the program has conducted 19 wellness campaigns in Mangochi. Of 765 people tested for HIV, 62 were positive. FISH also implements HIV programming in Machinga and Zomba districts. Soon after Layton started treatment, his health problems began to improve. "I go fishing like before," he says now. "If I had not accessed medical assistance in time, I could not have been strong enough to fish again and my wife and six children could have suffered." There was another benefit to being tested, too. When Layton got his diagnosis, his wife was tested, and she is HIV-negative. Now they're taking measures to be sure she remains HIV-free. "If I had not gotten tested," Layton says, "I might have infected my wife as well." Lead photo: Layton as he fishes.